I’ve had some recent DWI cases plead to Obstruction of a Highway. In each case my client was charged with a DWI, and the case had problems. The choice was between having a DWI jury trial, or pleading guilty to Obstruction. What is Obstructing a Highway? Read this earlier post. I usually, if not always, recommend taking the Obstruction plea rather than go to trial on the DWI. In the past, a DWI conviction had a ten year limitation for enhancement. That is, if you got 3 DWI’s that were each 11 years apart, the State couldn’t enhance your case to a felony (DWI 3rd is a felony in Texas). Not any more. The lege changed the law so that a DWI conviction can be used against your FOREVER. That is, if you get a DWI in 2008, and another in 2028; then the original 2008 conviction will be used to “enhance” your 2028 case. That is, the punishment is worse (from Class B to Class A misdemeanor). Every client I’ve had with a DWI charge states they will never drink and drive again. However, forever is a long time. A few years ago a doltish majority in Austin found a great way to balance the budget. Instead of cutting spending the lege invented millions of dollars in revenue from “surcharges” they would collect from those convicted of DWI. In theory those convicted of DWI are supposed to pay at least $1,000 a year to keep their license. In practice, most of these fees are never collected. These “surcharges” should be unconstitutional (double jeopardy) in that they punish a person twice for the same offense. DWI suspects already face fines, fees, court costs, and forced donations to MADD (victim impact class). 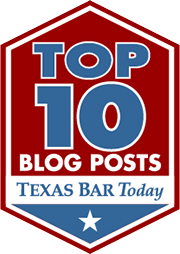 Unfortunately Texas appellate courts are more than willing to justify constitutional violations in DWI cases. By pleading to OAH, clients don’t risk the possibility of paying thousands in extra “surcharges” just to keep their DL. One of the services I offer is taking an uncertain criminal situation and providing guidance and direction to my clients. I am in the certainty business. When my clients are offered and OAH plea I can guarantee the DWI will be dismissed (not expunged though). With a jury trial, there are few things I can guarantee. Most defendants aren’t exited about the idea of having a jury trial. They would much rather take the certainty of an OAH charge. Even with a strong case for the defense I can’t guarantee a jury will find a client not guilty. The State has professional coached witnesses, and jurors are inundated with DWI propaganda. With those factors working against the innocent, an OAH plea can be a great resolution to a DWI case. I could not agree with you more Robert… although, it frustrates me that the State is willing to convict someone when the case they have “has problems” as you put it. But, I usually do the same thing with my clients DWIs when they are offered an Obstructing… plus, the damage to insurance is much less. I also agree. In Colorado alcohol conviction are lifetime convictions. A lifetime conviction should convince defendants to exercise their trial rights.